Funeral Services for Wilma Faye Square, 86, will be 11:00 AM, Friday, February 8, 2019 at Spear Mulqueeny Funeral Home, 667 Mentor Avenue, Painesville, Ohio. Family and friends will be received Thursday, February 7, 2019, from 4:00 – 6:30 PM, at the funeral home. Burial will be in Perry Cemetery. Faye was born December 25, 1932 in Waverly, Ohio to Earl and Ethel (Pease) Claytor. 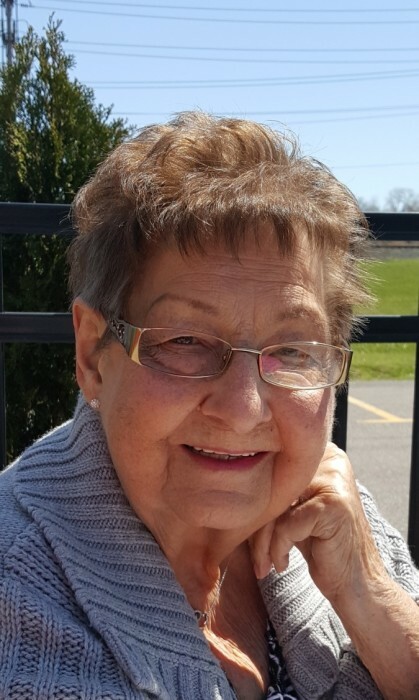 She passed away February 4, 2019 at Lake West Medical Center in Willoughby. Faye was a homemaker. She enjoyed camping, riding on the golf cart, crocheting, making quilts, and going to garage sales. But most of all, she enjoyed the company of all her grandchildren and great grandchildren. She is survived by her children, Lana (Bill) McBride; Reginald Square; and Elizabeth Square; grandchildren, Deena (Jaime) Whited, Kimberly (Bob) Fowler, Angela (Dave) Coryell, Curtis Square and Ryan (Jen) Square; great grandchildren, Brandon, Correy, Blake, Avri, Presley, Nicholas, Skylar, Owen and Henry. Faye was preceded in death by her husband Nicholas D. Square in 2016; son, Dennis Square in 2016; daughter, Nicholetta Square in 2018; her parents; brother, Malcom Claytor; sisters, Frances Garvin, Norma Jean Nygard and Louella Brown.